"As soon as the spray can was made, graffiti writers were born." So says Matthew James Powell, 26, who used to get chased by the cops when he was 15, but is now trying to make an honest living from his art. "Society makes up all this crap about graffiti, so people don't see the positive side. It's like the war on terrorism," says Powell. "You're never gonna make walls safe from graffiti by painting them white. Whitewashed walls attract taggers, whereas if kids see a cutting edge mural, they're gonna be awestruck. So what the city is doing in covering up graffiti is pointless. A lot of the kids who get caught up in gangs get out of them by doing graffiti." And some of them, as Powell reveals, go on to travel to other states, where they paint murals that get whitewashed by city officials who haven't quite caught up with avant-garde graffiti writers' thinking. "People from Texas, Minnesota, Oregon and Arizona totally snuck into an apple orchard in Watsonville, people who'd never ordinarily have come here, all because of that project," says Powell, who is a member of the group of seven artists that do Raging Sushi Productions and Walls 2 Riches. "Our art is way ahead of itself," he says. you're just gonna keep getting it revandalized. There's always some kid who's into it and will view a blank wall as a prime piece of real estate and take advantage of it, by spray painting or tagging, or whatever. But if there's a big mural, done by well known respected graffiti writers, then 95 percent of the time, no one's gonna go over it. It's a better idea to commission murals than repaint walls. A lot of store owners are angry about graffiti, maybe so angry they're not open to murals, but if they were, their walls probably wouldn't get vandalized." Corcoran says he didn't take graffiti seriously until he was 17 and was introduced to some people who were a little more famous and told him what not to do. The best piece of advice he's ever received? "Stay humble. If you think you're the best, you're done learning," says Corcoran, recalling how, when he had just turned 20, he was painting a fence in San Francisco, when the cops drove by. "Me and my friend ran to the back of the parking lot, scaled a double height chain-link fence, tore our clothes escaping through a hole in the next lot, only to find the cops waiting for us on the other side. We didn't escape, though it was fun trying, but the whole incident cost me $1,400 between going to court in San Francisco and everything. His solution to the incendiary combo of walls, spray cans and kids? "Encourage murals. A lot of people would rather take a 100 percent illegally street bombing approach. but you get to an age where you hit your limit, and want to do better, cleaner murals. A lot of kids meet me while I'm painting on the walls by Bill's Wheels, and I tell them about murals, but they don't understand. But you can't stare at a tag and get enjoyment. To me, murals are like eye candy, bright colors that get you to see what a person was thinking when he painted it." Corcoran says his dad, Myles Corcoran, who's also an artist, is totally supportive of his art, "as long as I'm not getting into trouble, not out doing illegal stuff, but some people, mostly younger ones, think I'm pretty much a sell-out for not doing anything illegal any more. When you're young in the graffiti world, it's all about fame and the adrenalin rush. The harder the spot is to paint the bigger the rush and the more people talk about you, so it's a hard habit to break. And I'm an adrenaline junkie." 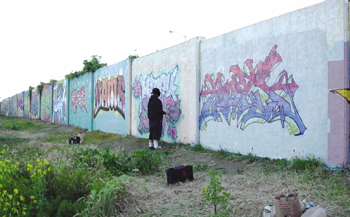 Jason Anderson, 29, says he was caught in downtown Santa Cruz 10 years ago, because there were no legal walls to paint anywhere, forcing him to paint at illegal remote spots. "I totally understand where someone is coming from when they want to paint over graffiti, plus I understand where the kids are coming from, too, so, I wish there were more walls to paint , but in my opinion, the people painting over graffiti are close-minded." As for his recent project in Watsonville that was painted over, Anderson says the quality left most locals and residents speechless. "They asked, 'How can you do that?' And being legal, helps stop the 'Oh, my, those kids should be arrested and sent to jail!' type of comments. What we do is high quality, with no clutter and few tags." From the April 30-May 7, 2003 issue of Metro Santa Cruz.